HALSEY, Neb. — Will Rogers is credited with saying, "The best thing for the inside of a man, is the outside of a horse." That truism is never more evident in today's world of cell phones, video games and computers keeping man, woman and child so wrapped up they do not take time to enjoy the outdoors or other humans, let alone other species. The weekend of Oct. 6 and 7 had over 85 equine enthusiasts away from technology to enjoy God's and man's handiwork in the Nebraska National Forest near Halsey, on the Sandhills Journey Scenic Byway, Nebraska Highway 2. Riders came from all over the state, including Omaha and Lincoln and outside the state, from Wyoming, Colorado, Kansas and South Dakota. To get to Windmill 125, the headquarters of the ride, one must travel off the access paved road onto a dirt road where only four-wheel drive vehicles should be allowed. Forest staff under the direction of district ranger, Julie Bain, saw that the area was mowed, windmill turned on pumping fresh water. 4-H camp staff, Jody Swisher at the helm provided meals for two days. This year marked the 20th annual 4-H benefit trail ride. It was the first without charter organizer and co-trail boss Gary Stauffer. Stauffer was a long time University of Nebraska-Lincoln Extension educator from O'Neil, who succumbed to ALS just one week prior to this ride. 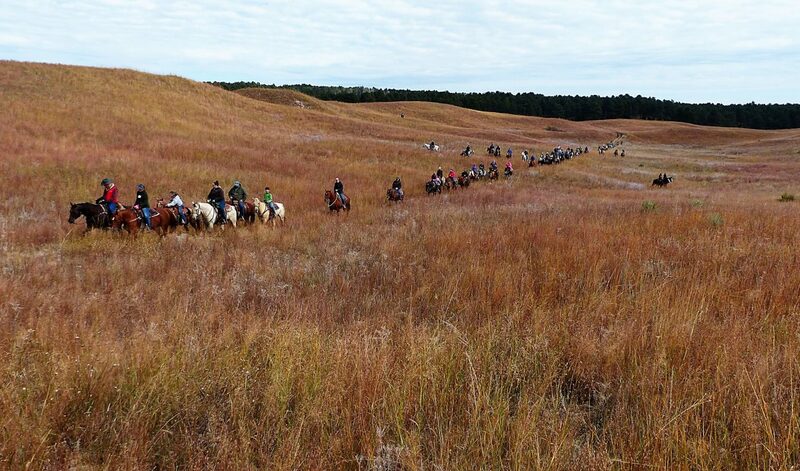 His fellow trail boss, Dewey Teel, Neleigh, himself a retired UNL Extension Educator, led Stauffer's riderless horse for the first segment of the ride to honor him. Stauffer's brother Monte, also in UNL Extension, later rode Gary's horse during the rest of the ride. Other committee members and fellow UNL Extension educators were Bruce Treffer, Lexington, and Kathy Pothoff, Lincoln. Stuart Sheppard, Nebraska 4-H Foundation director and his staff handled the registrations. The Licking family of Thedford made sure portable panels from themselves, Hall Cattle Co. and AL Ranch were at Windmill 125, as well as certified weed free hay, which is required on all federal lands. Those that came by Friday afternoon, held a Panel Party, helping the trail ride committee members set up the panels that had been borrowed. Saturday, the two rides had nigh on perfect weather for riding through the hills and trees, many looked up and thanked Stauffer. Teel and Monte Stauffer had come a few days earlier to blaze out this year's trails. 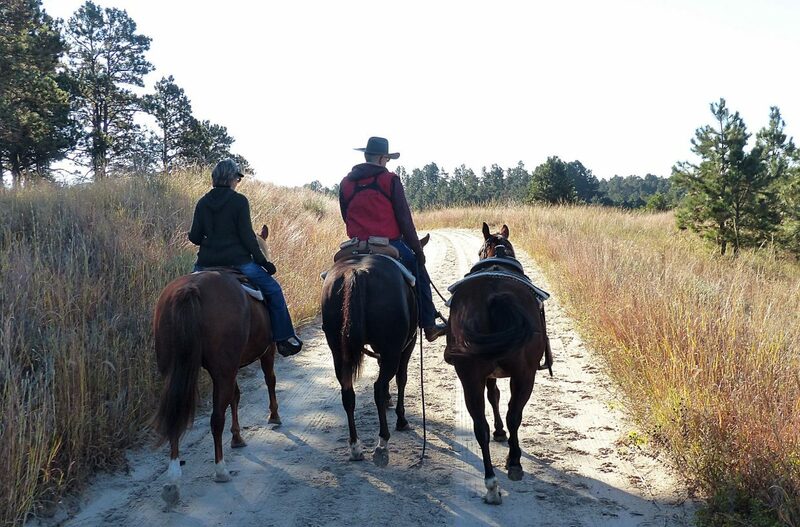 Many riders are repeats, while several enjoyed seeing the forest for the first time the best way possible, on top of a horse. The 90,000 acres is deemed the national forest preserve. Of those acres, 22,000 are hand-planted trees, which began in 1903. It is the largest hand-planted forest in the western hemisphere. It is also the largest public access for ATV riding in central Nebraska. 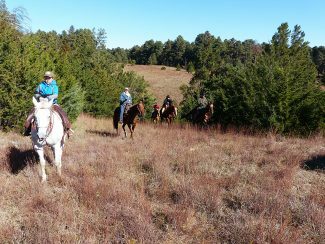 Unlike the ATVs though, horses and their riders had the ability to venture off trails and go where man-made machines could not. The two co-mingled amicably one time during the Saturday morning ride. There were two rides on Saturday; the first ride began a little after 9 a.m. and finished back at basecamp where a sack lunch was enjoyed by all and where some riders after caring for their horses, gave their other four-legged friends (their dogs) a walk. Dogs are allowed only on leash around camp, never on the rides with their owners. The three-hour afternoon ride, gave plenty of time after for the riders to take care of their horses and freshen up themselves prior to the great steak supper back at the State 4-H Camp lodge. Another treat this year that had been missing for several years, that of a team of horses and wagon allowing horseless attendees to enjoy the forest also. Don Licking, a rancher from North Platte, brought his matching team, Maude and Molly. Several took advantage of this, including some of the staff from Nebraska Educational Television, who filmed and interviewed riders for hours. "We plan on showing this segment in April on Nebraska Stories," said Kay Hill, NET coordinator. After supper on Saturday, a silent auction of close to 50 donated items was held. Attendees also saw videos of past trail rides and uncut, unedited photos of this ride taken by professional photographer, Terri Licking, fellow committee member.